The search for talent goes on at the mid to senior levels and advancement opportunities continue, especially for those with sought-after skill sets, according to The PRWeek/Bloom, Gross & Associates 2017 Salary Survey. In the big picture, the majority of PR pros (57%) agreed they are well compensated and very few (3%) believe their job is under threat due to economic conditions. Find out what PR pros are making these days and how your salary stacks up. Beyond salary, what are the compensation factors that entice potential employees? Are opportunities to work abroad still desirable? Do employees really care if an organization is a good corporate citizen? 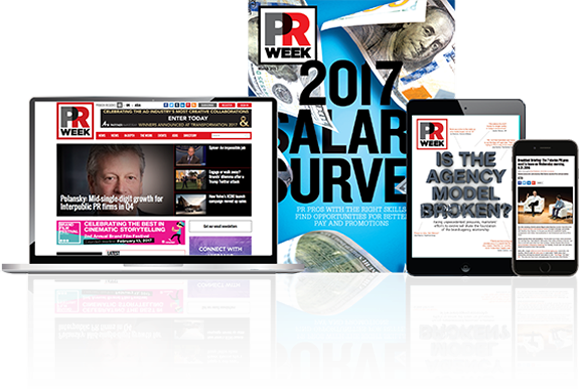 The 2017 PRWeek Salary Survey Premium Edition reveals these and other significant insights that will help both employer and employee make the right decisions. Along with additional content to the survey feature, this year’s premium edition contains salary trends by region, age range, and years of experience, as well as intelligence on compensation trends by the most practiced disciplines and level of degree attained. Plus, we’ve included “Spotlights” on select US cities that give you a true flavor of that local PR community.